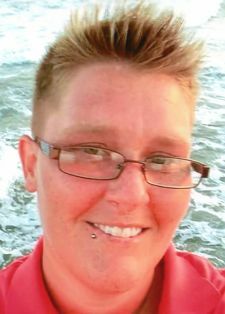 Danielle Elizabeth Bymaster, 31, passed from this life on Saturday, November 25, 2017. A memorial service will be held at 3 PM on Wednesday, November 29, at Fair Funeral Home Chapel in Eden. Inurnment will immediately follow in Overlook Cemetery. Reverend Lee Hull Moses will officiate at both services. Danielle, the daughter of Suzanne and Dan Bymaster, was born in Greensboro on June 4, 1986, and was a graduate of Northwest Guilford High School. She was a cheerful person, full of life and a joy to be with. She had a caring and giving heart and was totally devoted to her family and friends. Danielle graciously and freely gave and received love and will leave a void in the lives of those who knew and loved her. Danielle leaves, to cherish her memory, her parents; a sister, Lauren SaintSing; a brother, Michael Bymaster; her grandparents, Ann and Joe Fry and Betty and Buddy Self; nieces, Abbie SaintSing and Erica Brower; nephews, Jackson Washabaugh and David Bymaster; aunt, Amy Miller (David); uncles, Mike Self (Cathy), Todd Self (Cindy), and Robert Bymaster; and several cousins. I'm very sorry for the loss of Danielle. She was the first person to befriend me when I moved to NC. She ment a lot to me and my children. We will miss her deeply and we love her very much. Dan, So sorry to hear this. My heart aches for you and your family. I’ll say extra prayers for you guys for peace and comfort. This makes my heart break. I love you all - Godspeed. Suzanne I can't even imagine your pain. I am sure just by knowing she was your daughter that she was a spirited and beautiful person. Please know our whole family loves you and is very sorry for your loss. I'm so sorry for your loss. May God be with you in this of Need. I am so sorry for your loss, so very very sorry. I cannot imagine your grief, and hope she rests in peace. Many hugs for you all. I am very sorry to hear of your loss. My thoughts and prayers are with your family. To the Bymaster Family, I would like to send my deepest condolences for your loss. There are no words that can every express the loss of a loved one. We all long for the promise that God gives us at Revelation 21:4 which expresses this promise, “and he will wipe out every tear from their eyes, and death will be no more, neither will mourning nor outcry nor pain be anymore. The former things have passed away.” Continue to use her memory as strength to get through the tough times. Dan we are so sorry for your loss our prayers are with you and your family during this time. Suzanne, I am so sorry to hear about your loss. You are such a caring person and I know this has hurt you deeply. I'm praying for you. If you need anything at all let us know. We love you!